I've had a tagine for around 3 years and finally got round to using it recently as a way to support my better half in her low carb diet. This recipe was so tasty I made it again 2 days later. If possible use olives in oil not brine. 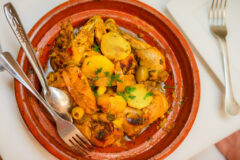 If the olives have been in brine then rinse them well to avoid the tagine ending up too salty.